Live chat is the ultimate sales hack. It’s a big call, but I stand by it. The reason is simple. It’s the easiest way to bump your website conversions in real-time without split testing. 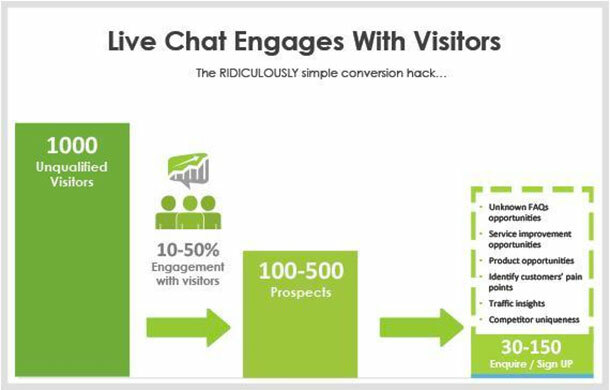 This won’t come as a surprise to many of you who have already tried live chat to increase leads (and save on customer service). But, for most of you, it didn’t work right away. Websites like Kissmetrics and SaneBox (which trialed our service when we founded) have tried live chat, and the data was conclusive. There was no increase in conversions, and in some cases a reduction. In this post, I’m going to deep dive into the data science and psychology of a successful live chat install, one that increases conversions. In the past, businesses used advertising to drive customers to a phone number. Customers would engage with a sales person. Every phone call had a person on the other end. Then the internet took off and put something called a website in the middle. Now, all those customers see a website before they talk to a real person. We expect a website to do the heavy lifting. It’s cheaper than humans, right? Not always. Statistics show that, on average, only 2% of website visitors convert to an enquiry or sale. There’s an argument that lots of money is being left on the table. Live chat is well positioned to be the fix. Real humans have a way of talking to the people you drive to your website. And, with live chat, businesses won’t need to worry if they don’t have the money, time, or resources for A/B tests or a landing page designed by Oli Gardner. In fact, you can have the world’s worst site, or even a blank website, and still convert. When you or your team sit on live chat, you should notice that between 10 and 50% of all your website visitors engage with you. If done correctly, typically, a third of those should become a lead or, in the case of E-Commerce / SaaS sites, buy or sign up. Most people make the assumption that live chat will work in all conditions. You get to talk to your customers so that’s a good thing, right? Websites that convert well do not work well with live chat. The psychology is simple. The visitor has likely come from Google and found their answer in 0.24 seconds. Then they hit your website, and it’s almost always going to take longer than that to find what they want. Live chat is the path of least resistance. But, this is not a good thing in situations where the website can outperform the live chat agent. Take E-Commerce. Online stores are designed for buyers, and buyers are comfortable purchasing this way. Proactive live chat can distract users away from the buying experience by seducing them into a conversation. Our research shows that a significant portion of visitors will choose chat over the prominent CTA. And because the “add to cart” and “checkout sequence” is easier than trying to complete a transaction through a live chat agent, live chat reduces conversions. Which Sites Work for Live Chat? I get asked this all the time. Truth is, they all do. But each type of site requires a different implementation. The easiest way to prove the ROI of chat is to capture leads from the conversations. Tracking uplift in signups and sales is a little trickier. If a website has a 5% or greater conversion rate, don’t use chat until you’ve mastered everything mentioned below. If a website has a 2-5% conversion rate, get some data (I’ll explain shortly). If a website has a conversion rate below 2%, launch chat immediately. On the sites that are converting well, I like to take a data-driven approach. The homepage might have a great conversion rate, but what about the “About Us,” “Pricing,” or “Contact Us” page. It’s possible those pages aren’t converting well. Create a list of all the main pages on your site likely to get prospective customers. Find the conversion rate for each page, split into business hours and after hours. For each page, find the average time to enquiry or signup. For example, from the time someone hits the page, it takes, on average, 25 seconds for them to start filling out the enquiry form, which they submit by 50 seconds. You can find this information using Google Analytics, Kissmetrics, or specialized apps like Formisimo. Before we look at how to use the data, we need to understand who the right customer is. The idea is to move mountains in order to talk to your best prospects but not talk to time wasters at all. Question: Which countries do your best customers come from? Which countries do the time-wasters come from? Answer: We get this data from ChartMogul. Question: Which pages on your site are your best prospects likely to visit? Which pages are time-wasters likely to visit? Answer: We look at the leads generated via our platform, and we look at the page chat was initiated on. Question: Which page on your site has access to a login/support/area where visitors can log in? Reason for the question: You don’t want to waste resources annoying your existing customers. Using the data above, install the live chat platform on the pages that mean the most to you. Some chat platforms need you to install the platform on all the pages. This is to ensure that a conversation can continue if the visitor is clicking through pages. “Greetings” is industry lingo for automated chat popups. It’s a critical feature for generating leads. Good live chat providers let you customize the opening sentence based on the greeting. This creates a more personalized experience for your visitor. Have the “time on website” trigger set to “equal to or greater than the average time to completion of CTA/form.” That is, don’t distract people before you’ve given them a chance. If you do have a login section for existing customers, don’t show chat on any page where they can access it (unless you are providing customer support which is a totally different beast). Different applications need different setups. Getting it wrong will cost you. Some companies want the website to do the heavy lifting without a sales person. Think E-Commerce sites or certain SaaS sites where you can sign yourself up without requesting a demo. 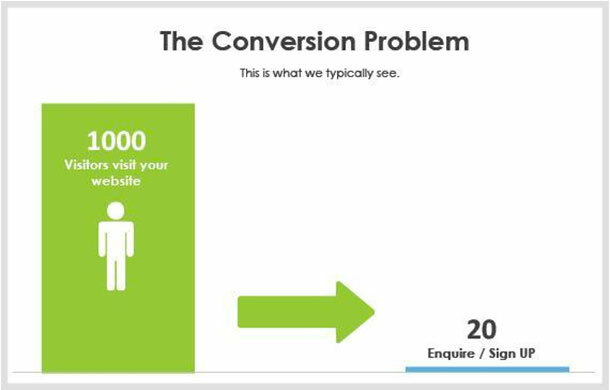 The idea is that you’ll still have your same conversion rate on site, plus a few more people whose concern you solved. And you’ll also have a whole bunch of leads who wouldn’t have converted during that visit, people you didn’t know and wouldn’t easily get back. Then let email/content/automation or a direct response from your sales team do the work. Using live chat for lead generation is becoming much more common. Have a FAQ or knowledgebase system that sits side-by-side with your chat console (or use a Google doc on another screen). This helps you answer visitors’ questions faster. Have an easy way to capture lead information (for example, set up a Wufoo form with fields for name, email, etc.) This ensures that you have a separate place for all your leads. During a chat conversation, don’t be afraid to control the conversation and ask for details. Expert Tip: I want you to imagine a scale with leads on one end and customer satisfaction (CSAT) on the other. When a visitor comes to your site, what they’re hoping for is to have alltheir questions answered, instantly. What your business wants is the largest number of leads you can capture from your traffic and a reduction in your CPL. If you are just robotic and go for the kill, you’ll get leads but tick customers off as well. To each end, leads and CSAT are mutually exclusive. The balance is to provide 5-7 FAQs in response to questions, and use an exit statement for anything else. Customer support is a different beast altogether. The goal is to reduce the amount of email and phone tickets and resolve customers’ issues on the fly. The reason support works via chat is you can have the backwards and forwards in real-time without chewing tickets and email responses, which can take days or weeks to resolve, ultimately infuriating your visitors. From my experience, you do need dedicated agents – people who know your product inside and out. The best way to begin is to have your sales and/or product people handle support requests for one month. Then you can create a knowledgebase of all the questions and answers and provide it to agents you hire to do your support. There are a few key players: LiveChatInc.com, Zopim, Olark, LivePerson, SnapEngage, and I’d throw in Tawk.to (because they’re free). 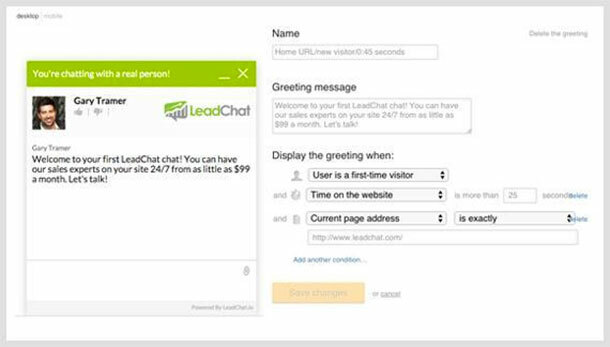 At LeadChat, we actually use the LiveChatInc.com platform because it’s by far the most advanced. It’s rude. People see chat, they expect chat. It’s not nice to trick them into an offline form. Either have chat online, or off. We find offline message capture still distracts people from the core CTA, with the added issue that there are no agents to respond to questions. If you have chat, you should answer people when they ask. 15 seconds is our rule of thumb. Anything longer is unfair. Your website doesn’t close, neither should your chat. After hours represents more than 60% of your week because two-thirds of the day is after hours and there are weekends. We see 50-60% of leads come through for our clients after hours. You can find chat agents on Upwork.com, Peopleperhour.com, or specialist companies like ours – LeadChat.com. Beyond leads, you will capture amazing insights through the chat transcripts. Traffic insights – Are you getting poorly qualified visitors and leads? Product opportunities – Are people asking for things you don’t do? Consider offering those. Missed opportunities – Why are people asking about things you clearly offer? Maybe your website is not communicating this well enough. Top 5 FAQs –What are the most common questions? Could you fix your homepage to address these better? Live chat is here to stay and is an amazing tool for communicating with visitors if it’s done right. 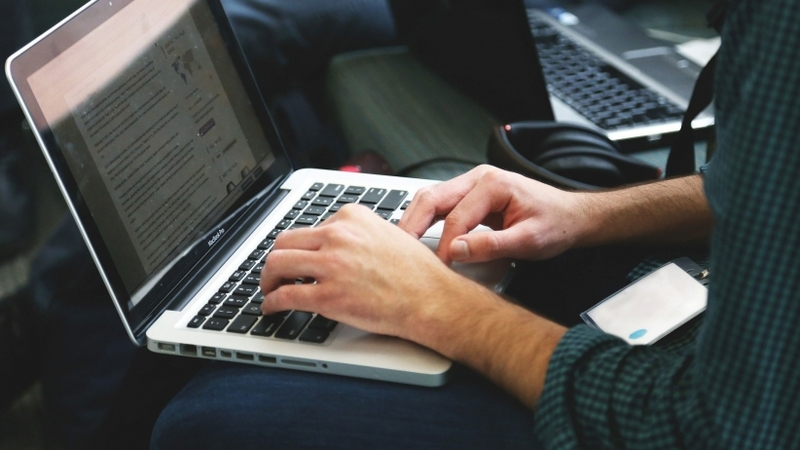 Determine why you want live chat: More leads, more conversions, or to offer customer support. Take a data-driven approach and create a benchmark. Follow the guide above and you’re sure to get some great results.